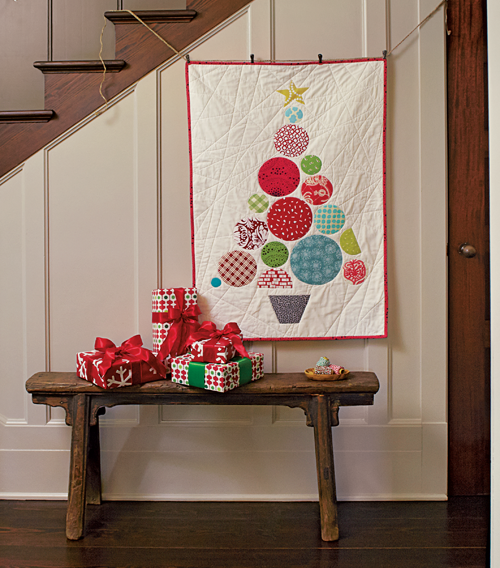 ’Tis the Season for Quilting! Holiday tradition meets modern quilting in this colorful tree made by Gayle Schliemann entirely from circles. Combining simple shapes and easy techniques, it makes the perfect seasonal home décor accent. Bonus: You’ll have fun practicing your appliqué technique! 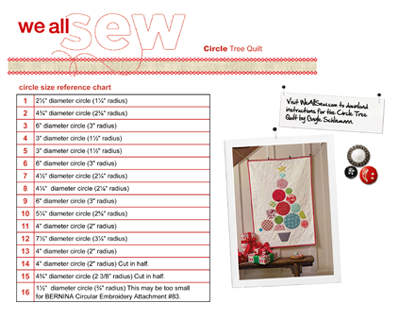 Before beginning, download the Circle Tree Quilt Layout Guide and Circle Size Chart PDF. Enlarge the tree pattern 395%. Step 1) Mark the appliqué layout. From the white background fabric, cut a 32” x WOF (width of fabric) rectangle. Mark the vertical and horizontal center lines with a water-soluble marking pen. Using the downloaded layout guide, center the tree on the white background fabric. Trace the circles, star and base – this way you will know where to position your appliqué pieces. 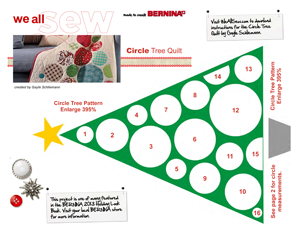 Tip: If you are using BERNINA Circular Embroidery Attachment #83 you only need to mark the center of each circle. Step 2) Appliqué the circles. • Trace the circles, half circles, star, and base onto the Heat n Bond Lite fusible web. Make sure that you label the circles 1-16 so you know where each one goes. • Cut the shapes out roughly, about ¼” to ½” outside the lines. Fuse the shapes to the wrong sides of the appropriate fabrics following the manufacturer’s instructions. • Cut out the shapes, cutting exactly on the drawn lines. Do not remove the paper from the circles yet! You want to be able to see the labels so you’ll know where to place them on the background fabric. • Match Circle 1 with its traced outline. Remove the paper and fuse the circle in place following the manufacturer’s instructions. Repeat for rest of the circles, half circles, star, and base. • Using a water spray bottle, lightly mist the back of the HydroStick stabilizer to activate the glue. Do not overly wet! Attach the stabilizer to the back of the background fabric following the manufacturer’s instructions. • Sew up your sewing machine with an open-toe foot and a straight stitch. You may also use the single blanket stitch (#329 on most current BERNINA sewing machines). The Altered Stitch Memory feature on BERNINA sewing machines is great for this, as you can toggle back and forth between these stitches without having to readjust the settings each time. Test stitches on scraps of fabric and stabilizer; adjust tension if necessary. • Move the needle position all the way to the right. This way you can line up the edge of what you are appliquéing with the inside edge of the foot’s right toe. When the needle swings to the right, it will just barely go off of the appliqué material, forming a perfectly placed appliqué stitch. Tip: Engage the Needle Stop Down feature, if available, and pivot only when the needle is to the right of the applique material. Use the Free Hand System (knee-activated presser foot lifter) to raise the lower the foot while the needle is down in the fabric; this makes it easy to pivot at the corners and around curves. • Appliqué the half circles, star, and base in the same fashion. • Carefully remove the stabilizer from the back of the appliquéd shapes. • There is no need to use the fusible web on the circles for this method. Just make sure your scraps are bigger than the circles. • Set up your sewing machine as for the Basic Appliqué Method above. Install the Circular Embroidery Attachment following the instructions included in the box. • Using a seam gauge or small ruler, set the attachment for Circle 1, with the pin 1 1/4″ from the center needle position. (See Circle Size Chart on downloaded PDF.) Place the marked center of Circle 1 on the background fabric exactly on the pin of the attachment; be careful not to prick your fingers as you position the fabric! Lightly mist the back of the Circle 1 applique fabric with 505 adhesive, then position it on the background fabric with the center of the fabric piece on the pin. Replace the rubber stopper on the pin. • Using a straight stitch, begin sewing, keeping the work flat so the circular embroidery attachment can do its job – like a compass – turning the fabric in a perfect circle. Trim the applique fabric away from the outside of the straight stitching, leaving just the appliquéd circle. • Switch to the single blanket stitch and repeat, using the securing function or securing stitch at the beginning and end so that your beautiful stitching does not come loose. Repeat for the remaining circles, remembering to reset the radius (distance from center needle position to the attachment pin) to the appropriate size for each circle. • For the half circles, star and base, follow instructions for the Basic Appliqué Method described above. Step 3) Quilt the circle tree. • Baste the top, batting and backing together using safety pins, 505 adhesive spray, or your favorite method. • Stitch around the circles, star and base with thread to match your background fabric. • Use the walking foot to sew random straight lines in the background fabric. Be sure to stop and secure threads as you do not want to stitch through any of the circles. • The amount of quilting you do is up to you; refer to the instructions on your batting for minimum requirements. I like to place my lines no more than 8″ apart. Step 4) Bind and finish the quilt. • Trim the quilt to 27″ x 40″, centering the tree on the vertical center line. • Cut the binding fabric into 2½” x WOF strips. Stitch the strips together using diagonal seams to make one long binding strip. Fold the strip in half lengthwise, wrong sides together; press. Bind the quilt using your favorite technique. • If desired, add a hanging sleeve to the back of the quilt. • Don’t forget to sign your work!